Lions, Tigers, & Scares…Oh my! Visitors go Wild for Zoo Halloween attractions! This past week, I had the unique opportunity to experience two zoo Halloween attractions located over a thousand miles from each other. Both Daves are volunteer docents (from the Greek word “to teach”) at their respective zoos and enjoy sharing their important conservation messages with thier guests. I have been affiliated with Chicago’s Brookfield Zoo for over 13 years (both as employee and volunteer) and David Albaugh joined his zoo (Roger Williams Park in Rhode Island) earlier this year. Before I continue, let me state that this is NOT a compare/contrast piece. Each year, numerous guests at the zoo will say things to me like, “Your zoo is better than mine,” “My zoo is better than yours,” etc. The truth is, all Association of Zoos and Aquariums (AZA) accredited zoos are not in competition with one another. In fact, it is quite the contrary. These non-profit organizations all work together for the singular purpose of doing important conservation research around the world (which most of the public is unaware of ) while also educating and connecting their visitors with nature during their recreational visits. These endeavors, as well as the care of their beloved animals, requires money and, for zoos located in areas that experience the changing seasons, means coming up with creative events to attract visitors after the warmer months have past. 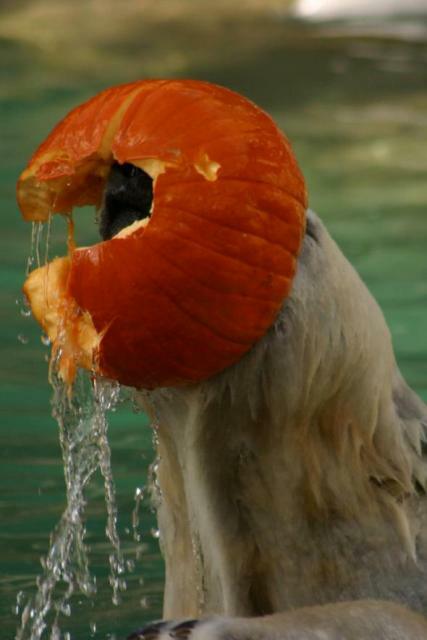 The popular Halloween season has proven to be the perfect opportunity to do so but, in keeping with the zoo’s mission, can not involve dressing the animals up in costumes or teaching the monkeys how to carve pumpkins. For this, they must become a tad more clever and I am happy to say that both of the aforementioned zoos have succeeded in doing so! I remember during my day visit gazing at some of the pumpkins from a distance and thinking, “Oh, that should look nice.” Nothing could have prepared me for how incredibly amazing this attraction truly was! Each year the zoo chooses a different theme with this one involving a trip around the world. Interspersed amongst your garden variety (pardon the pun) jack o’ lanterns were highly detailed and ornate designs that depicted various scenes and personalities from around the globe (as well as the occasional monster). Each section also featured music from that portion of the world which made the experience even more enjoyable. At 40 acres, Roger Williams Park Zoo is a relatively small park that makes excellent use of its space. 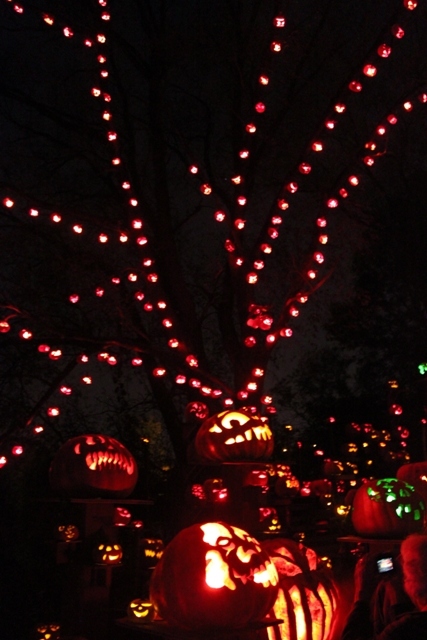 Their Jack O’ Lantern Spectacular was no exception and it took us well over an hour to venture through it. Just like a fireworks display seen during the Fourth of July, the pumpkins got better and better as we went along culminating in what I can only describe as its “grand finale.” By this time I had regressed to the age of ten and began jumping up and down while cheering! I would later write on the RPW Facebook page that had this been the only attraction I’d seen during my trip to New England it would have been well worth the airfare. In this I was 100% sincere and urge anyone in that neck of the woods (or beyond) to pay it a visit. Be sure to get there early as we toured on a Monday and the line stretched out of the gate! The next day I flew home to Chicago and then, on Friday, went to see Brookfield Zoo’s “Creatures of the Night.” For many years BZ had offered their family friendly “Boo at the Zoo” during daylight hours and then, in 2009, added a completely different night time event that caters to all demographics. Most of the park is open to visitors during this time and, being a larger zoo (216 acres), provides numerous activities to the delight of their guests. 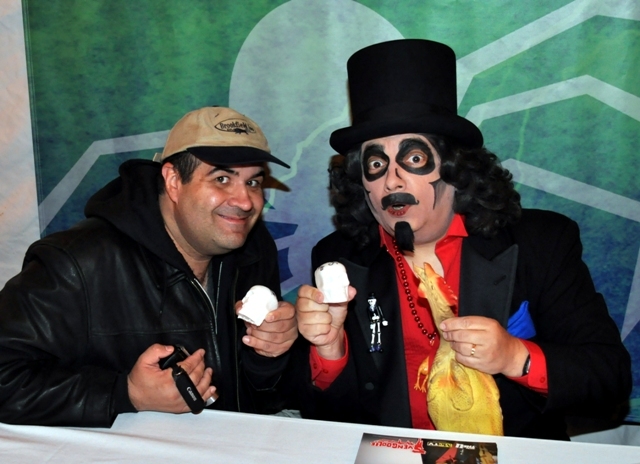 The night I attended also featured an appearance from National Horror Host, Svengoolie! My two worlds collided as my favorite celebrity paid a visit to my favorite place on Earth! I arrived early to snap a few photos and then returned later that evening when the zoo reopened for this event. I walked past the North gate gazebo and noticed that the number one question being asked of the friendly volunteers there was, “Where do we see Svengoolie?” By the time I raced past the zoo’s corn maze to the special area designated for Sven (courtesy of Best Buy who were sponsoring it) a long line had already begun forming. 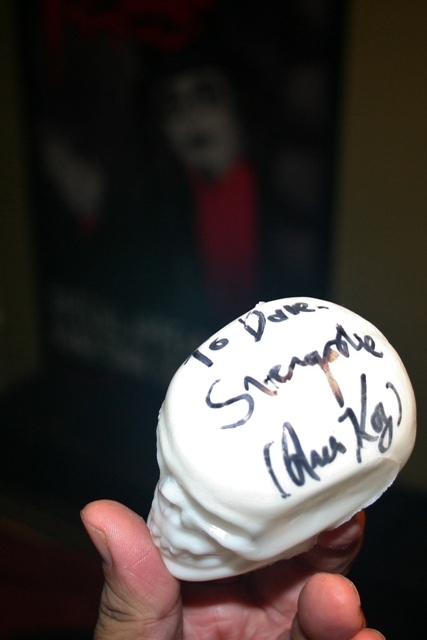 Sven drove in via a zoo golf cart and I had him sign a special Halloween Mold-a-Rama I’d created in the park earlier. 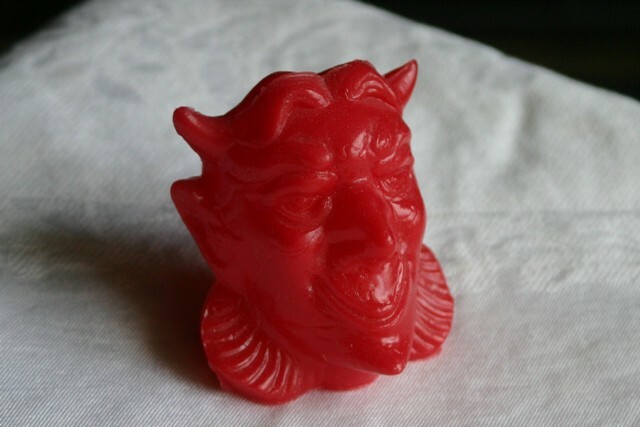 Wax Mold-a-Ramas – a Brookfield Zoo tradition! I also used the opportunity to hand deliver an autograph from NIGHTMARE ON ELM STREET‘s Robert Englund (in a story we’ll be covering soon) that I had obtained in Massachusetts the Friday before! After leaving Sven I encountered a large wooden structure surrounded by a group of enthusiastic onlookers. 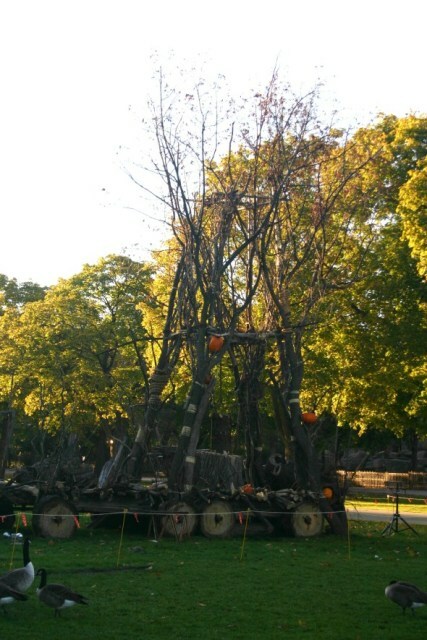 Little did I realize, I was about to witness a “pumpkin execution” hosted by the executioner himself – an amazing actor that did a tremendous job riling up the crowd. When asked the status of the pumpkin in question, the crowd screamed “Guilty!” as it was promptly placed in position to meet its fate! Daytime shot of a pumpkin’s worst nightmare! The drummers began their sinister death roll as all eyes fixated on the doomed pumpkin. Soon a large log dropped from above, smashing it to smithereens as the delighted crowd cheered! 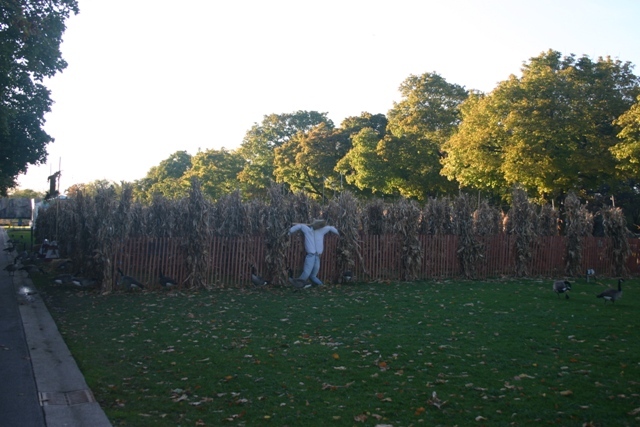 This was matched by the happy cries of visitors lost in the zoo’s corn maze nearby. 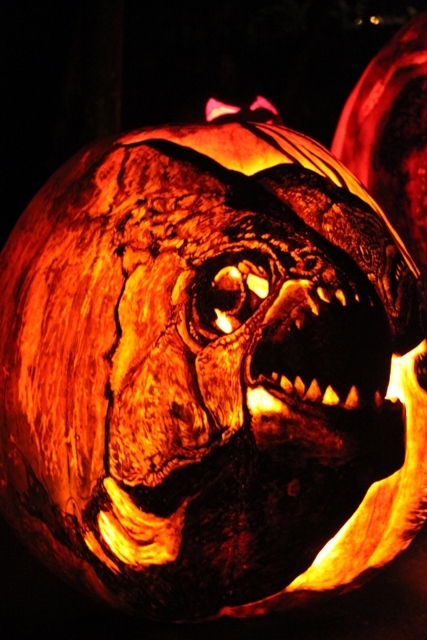 Lose yourself in Brookfield Zoo’s Creatures of the Night! After that I took a ride on the zoo’s Haunted Tram and inadvertently began my “Scream Vacation” as I was taken from one frightening destination after another! This would not only involve visits to exotic locales such as Marrakesh and Egypt, but even a drive through Elm Street USA along with an unwelcome visit from Freddy Krueger (which was ironic since I’d just communed with Robert Englund the week before). As the nerve rattled vacationers stepped off the tram (with the familiar sounds of a certain Texas Chainsaw behind them) I walked to the zoo’s beautiful Pavilions to see what macabre opportunities it had to offer. Here were lots of great family activities such as pumpkin carving, cookie decorating, and Halloween dancing! Brookfield Zoo’s “Creatures of the Night” actually offers TWO haunted journeys – one on wheels and another on foot. I made my way to the east end of the zoo to experience the zoo’s “Trail of Terror: Underground.” As its name implies we walked down through an archaeological dig site to see what the scientists had unwittingly unearthed! Before entering, a bloody victim urges us to reconsider, though no one appeared to heed his warnings. Pictures and videos weren’t allowed and I certainly don’t want to give anything away. Suffice it to say, this was one the best scary attractions I’ve seen anywhere! As a monster fan, I was thoroughly impressed by the unique creatures created specifically for this event. Squeeky mole monsters and some amazing insect-like fiends looked better than the majority of beasties created by Hollywood itself! SUPER cool and alone worth the price of admission! Should the creator of these monsters happen to be reading this post, we urge you to contact us for a featured story. 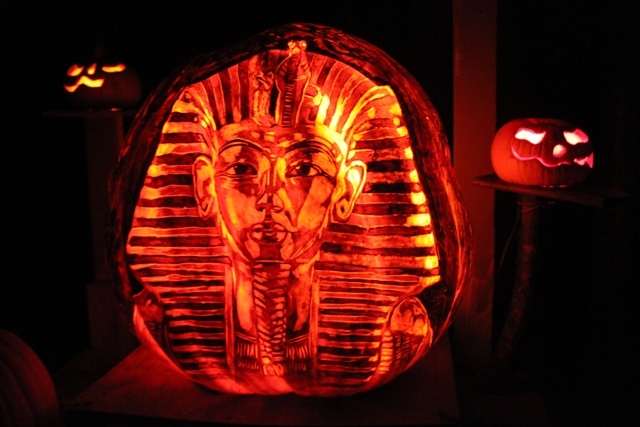 Kudos to The Roger Willams Park and Brookfield Zoos for their horror inspired Halloween events! They have proven far more satisfying than the majority of haunted attractions that specialize in this sort of thing. Best still, the money is ALL for a great cause! These zoos both provide plenty of treats with no tricks so grab your family/friends and get out there! The Daves would like to urge all of our readers to support their local AZA accredited zoos! Especially our patron zoos; Rogers Williams Park (which you can visit HERE) and Chicago’s Brookfield Zoo HERE! Now more than ever, these fine institutions need your help in continuing their amazing conservation initiatives! If you have a love of nature and would enjoy the opportunity to learn more about the zoo’s animals while inspiring their guests, look into volunteering like The Daves! 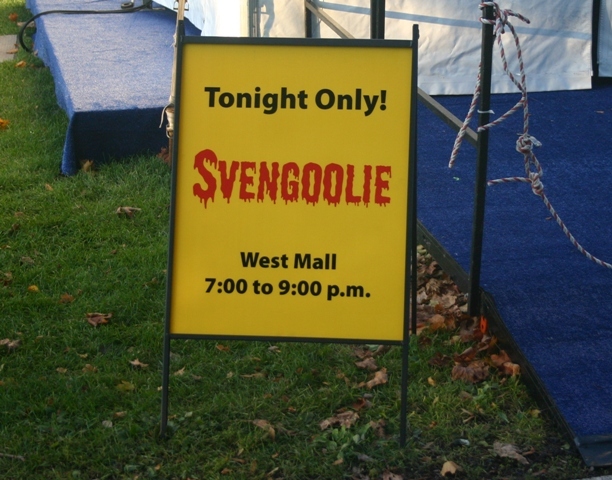 This entry was posted in Halloween, Haunted Attractions, Stalking Svengoolie! 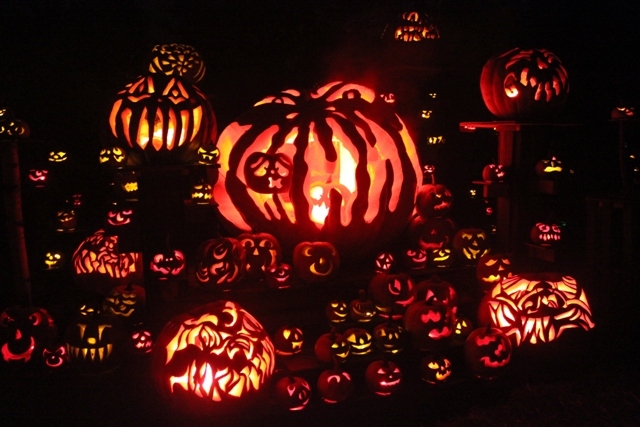 and tagged AZA, BROOKFIELD ZOO, CREATURES OF THE NIGHT, Jack-O-Lantern Spectacular, Roger Williams Park Zoo, Svengoolie. Bookmark the permalink. ← ROCK N’ SHOCK 2011: New England’s premiere Horror Event!